New york, NY - Several hundred people enjoyed kosher barbeque, scenic views of the East River and a chance to hobnob with Jewish movers and shakers from all across New York City at Mayor de Blasio’s annual Jewish Heritage Reception held Wednesday night at Gracie Mansion. 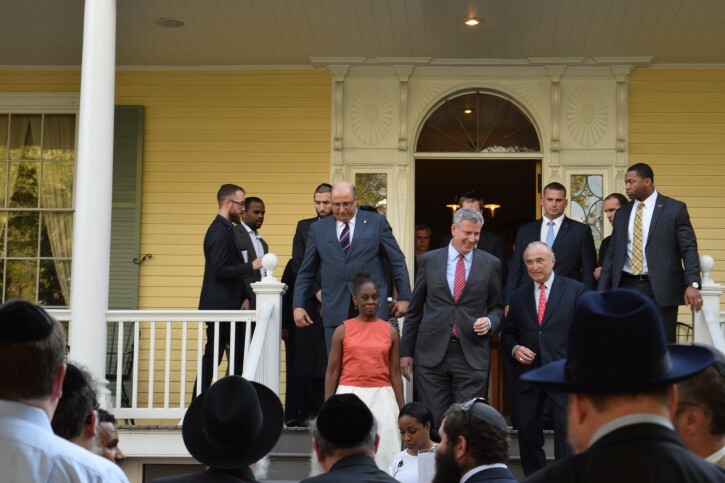 Both Mayor de Blasio and First Lady Chirlane McCray peppered their remarks to the crowd with Hebrew phrases, with the mayor intoning “tzedek, tzedek tirdof,” while his wife spoke about the importance of tikun olam. 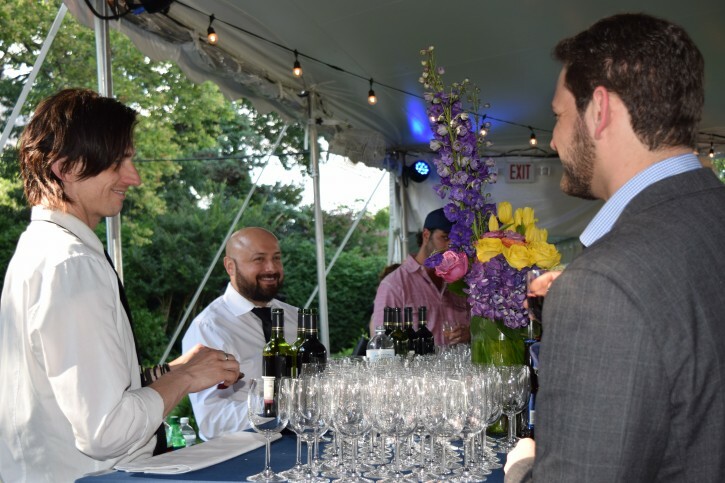 de Blasio was in high spirits, good naturedly repeating a joke he has shared on several occasion with two of his Israeli counterparts. “I like to do a thing where I talk to the mayor of Jerusalem, in this case Mayor Barkat, and the mayor of Tel Aviv, Mayor Huldai, and I like to remind them in a kind of ribbing way, that within the city limits of Tel Aviv and within the city limits of Jerusalem there are not as many Jewish people as there are within the city limits of New York City. It’s very embarrassing for them, but I do it every chance I get,” quipped de Blasio. A relaxed looking de Blasio seemed to enjoy the evening, lingering after completing his remarks as he chatted with guests and posed for numerous photographs. 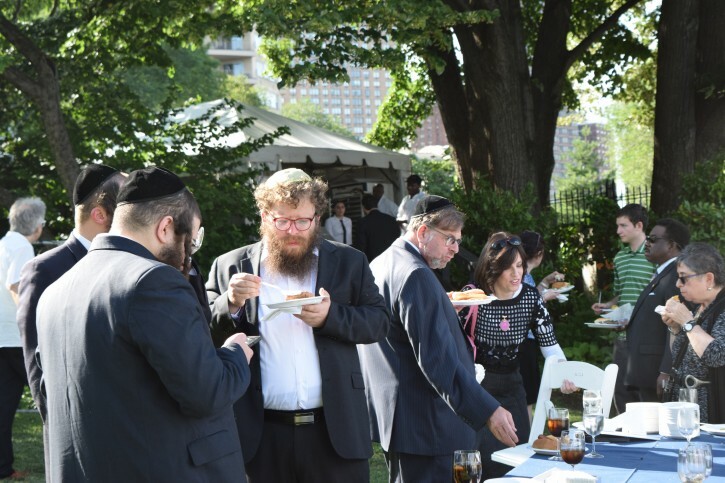 ‎Executive Director at Boro Park Jewish Community Council Yeruchem Silber, who worked with the mayor when he served on the City Council, called the mayor a true friend to his Orthodox Jewish constituents. 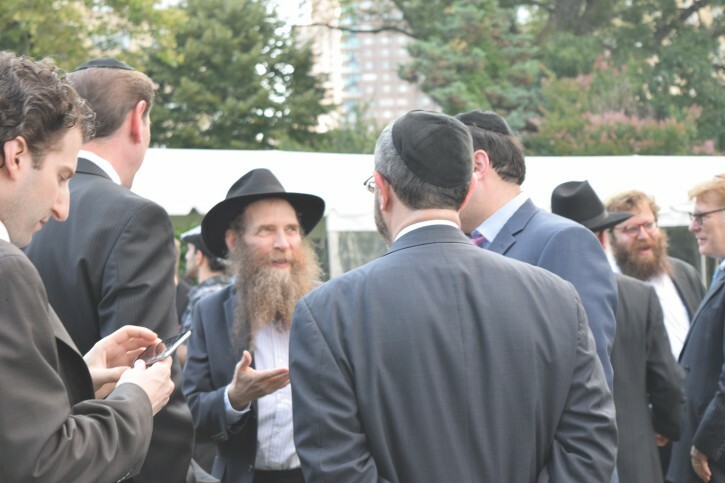 Cantor Joseph Malovany praised the mayor for his support of Jewish heritage while City Councilman Stephen Levin thanked de Blasio for hosting the reception, which drew a diverse swath of Jewish New Yorkers. Queens Assemblyman David Weprin spoke about the various types of legislation enacted in New York that favor Israel and the Jewish community, including Governor Cuomo’s recent announcement to boycott those who support BDS. 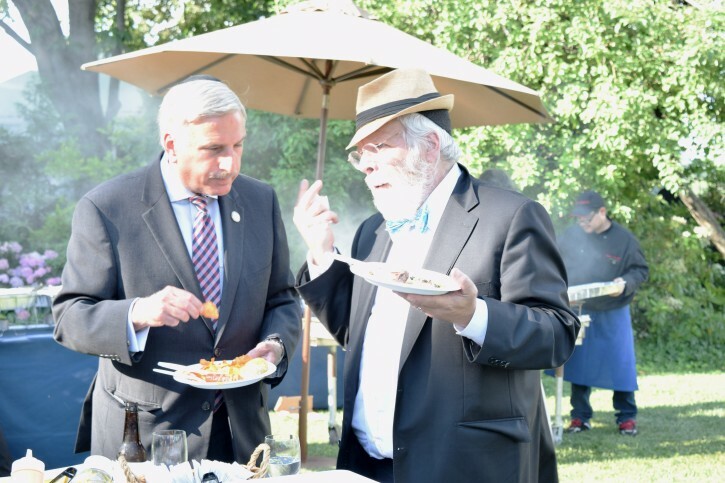 Weprin said that he has been working for the past three years to enact a religious garb bill, which has yet to be approved by the State Senate. 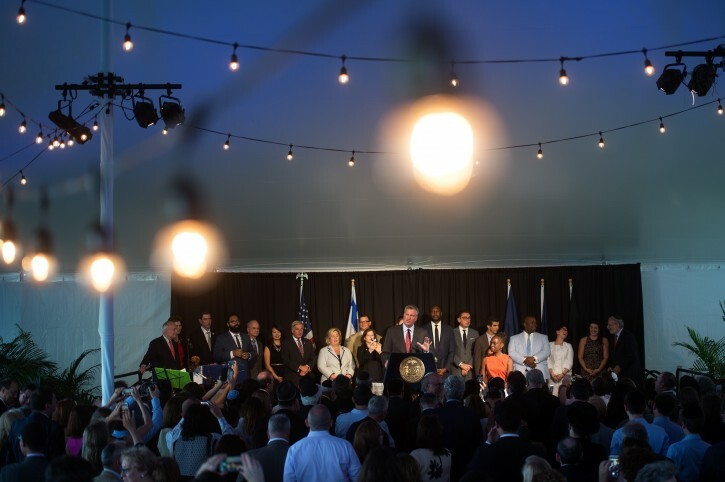 Gregg Bishop, commissioner of the New York City Department of Small Business Services, said that he hopes by networking with members of various communities in the city he will raise awareness of his agency’s services. “There is actually a government agency that is looking to help small businesses, to help people find jobs and to strengthen commercial corridors,” said Bishop. Bishop said that he hopes that his meeting with COJO in Brooklyn several months ago will result in more Jewish businesses availing themselves of the city’s services. “I have met with a lot of different organizations and the hope is that by building awareness through those organizations we will be able to reach out to the network of organizations that they connect with as well,” said Bishop. While the reception may have been arranged to pay tribute to Jewish heritage, it was the mayor himself who seemed to be the guest of honor. "hobnob with Jewish movers and shakers from all across New York City"
The ones who aren't currently unavailable because of a prior engagement in prison. “ "hobnob with Jewish movers and shakers from all across New York City"
same exact people EVERYTIME, very disengenious of Mr. Goldenberg (who serves on COJO, therefore hosted Comm. Bishop) to claim to speak for the community, he speaks for himself as does old buddy Silber, both of these guys have orgs. that get money from the city so they have a clear conflict here. de blasio DOES NOT represent our interests only those of the moneyed interests like Goldenberg. de blasio went out of his way to make sure the Assembly didn't pass yeshiva tuition credit assistance. remember the meal Achachverosh threw in Shushan it was also glatt and had the "movers and shakers" there, shakers since they are shaken down for "donations". That certainly looks like that Jewish Media Darling Zev Brenner. He wouldn't miss the opening of an envelope. If you look at the top picture, 2nd one scrolling down, u will notice that the Mashgiach is asking the shaker's and mover's movers "where did u get this stuff"? bist mishuga gevarin " ?? Hilarious, I couldn't stop laughing from these well written funny comments!